This lovely hill top town is believed to be one of England's oldest boroughs. Its magnificent mediaeval Abbey Church contains a 15th-c monument to Athelstan (AD 925 to 940), the first true king of the English. His grandfather 'Alfred the Great' granted Malmesbury a market charter in AD 880. 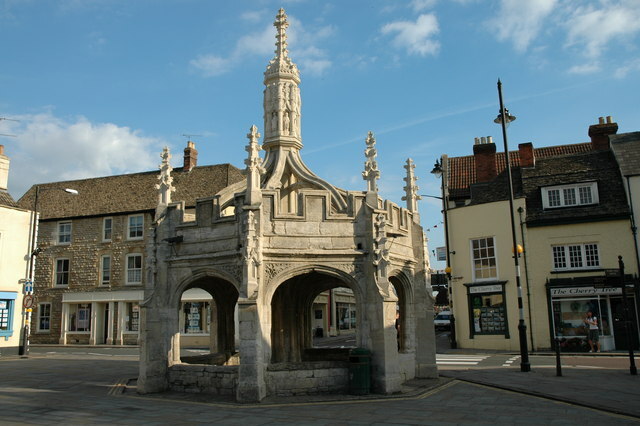 The late 15th-c Market Cross it is a lovely stone vaulted structure under which the market traders once sold their wares. The structure is 40 ft tall and of similar stone arched and buttressed style to the one in Salisbury. It was constructed of local stone in 1490, when the town was wealthy on the proceeds of the tanning and felt industries. The town lies over the confluence of several Avon tributaries, providing pleasant riverside walks. There are six ancient bridges that lead into the market square. The town has a pleasant High Street filled with many independent shops, cafes, pubs and restaurants. Its lovely Cotswold stone houses were built during the 17th and 18th century by local rich weavers and merchants. Most of the buildings are made of locally quarried stone, including the very fine 17th-c St Johns Alms Houses, which includes a late Norman Arch. Buildings of Interest include Abbey House, built by William Stumpe on the site of the old Abbots house. The arched Tolsey Gate, which has two cells, one on each side, once served as the town gaol during the 18th and 19th centuries. The Bell Hotel was built during the 16th-c over the location of the dissolved monastery gate house, and constructed with stone and timber from the old monastery buildings. Thomas Hobbes the philosopher and Joseph Addison the writer and statesman, lived here from 1710 to 1719. This important historic museum, located in Malmesbury old town hall, is dedicated to Athelstan, the first king of England. It recalls the history of Malmesbury and the surrounding area. Founded in the 7th century by the Benedictine monk St Aldhelm (AD 639 to 709). During the Dissolution the Abbey was sold off to a local wool merchant who used the buildings for a cloth weaving factory. 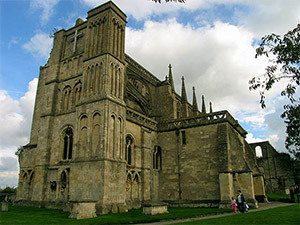 He later bequeathed the Abbey's nave to the town as a Parish Church. Its Norman porch is said to be one of the finest in England and has richly decorated archways. In the year 1010 a local monk called Elmer climbed to the top of the Abbey Tower and attempted to fly from its pinnacles with artificial wings. He glided for some 200 yards before crashing and breaking both legs. His epic flight is commemorated in a stained glass window.